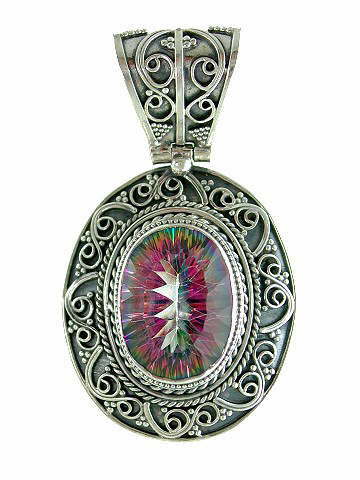 Extra large, majestic oval brilliant-cut, Mystic Topaz facet, set in a substantial and ornate 925 sterling silver mount. Mystic Topaz was first introduced at the Hong Kong Jewellery Trade Fair in 1998. It is genuine, natural Topaz that has been enhanced by bonding or coating the gemstone surface with Titanium; in a similar way that the Aura Quartz crystals are created. The coating is only one micron thick but its effects are permanent, and the effect is quite magical, producing a stone with an iridescent, mystical appearance. It has the added benefit of enhancing the already beautiful metaphysical properties of Topaz with the energies of Titanium. This combination greatly amplifies the Third Eye or Brow Chakra – it utilizes the spiritual vibration of Topaz and creates a beautiful seer’s stone.